Wonder how to get Soulhunter Kayn? It is available in the League of Legends shop right now! You can hop right in there, buy it and test it right away! The skin is showcased in the skin review to the right! A new super cool Champion has joined the rift – Kayn! With his release came his first, inauguration skin in Soulhunter Kayn. The Champion is a mix between two entities – Kayn the Shadow Assassin or Rhaast, the demon trying to take over the host body. 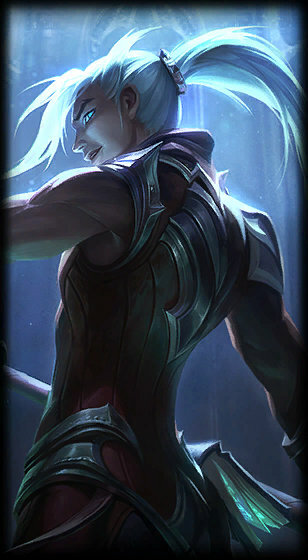 The early playstyle of the Champion is centered around this push/pull of the two entities trying to be the dominant being and take over Kayn’s body. All of this revolves around collecting soul fragments from Champions that he fights, hence Soulhunter Kayn. With all new colours, textures and even some animations, Soulhunter Kayn is sure to give you a whole different dimension when piloting this Champion on Summoner’s Rift. The skin was released on July 12th 2017. This skin is a part of the Soulhunter skin line. They always feature amazing updated graphics and animations that make battles ingame absolutely stunning! If you want to check out the new patch, Lolskinshop can help you, we are selling PBE accounts. Note Lolskinshop.com does not sell this skin, never have, and most likely never will! This page is an information page. We have collected all the different parts needed to create one good page that highlights every part of this specific league of legends skin. We would also like to point out that the only way to ever getting this skin is through the official Riot store, where you buy it for Riot points. There is no point looking for it on Ebay or other third party sites, it simply does not exist!